This Excursion departs daily at 9.15 and 12.15. Spring is a fantastic time of year to visit the Dutch countryside. In April tulips are blooming and there is plenty of birdlife, also tours will be a little less crowded. We are comparing Zaanse Schans, Volendam, Marken and Windmills with Free 1-Hour Canal Cruise Prices from leading ticket suppliers and Try to find you Cheap tickets prices on the market. Leave behind the canals on Amsterdam for an entire day and ride on a comfortable sightseeing coach into Holland's charming countryside. Once onboard you can settle in and listen to the commentary of your onboard guide. Learn a little about the region whilst enjoying panoramic views. First, you'll drive to the quaint village of Zaanse Schans. Here you will see classic Dutch houses, working wooden windmills and visit a traditional cheese factory. Don't forget to taste a few and pick up your favorites in the factory's shop. Later you'll explore the waterways on a boat trip to Maken. After cruising on the gentle waters you'll arrive at the village and take a tour of an authentic clog making factory. You'll have the opportunity to see how these surprisingly comfortable shoes are made and maybe even try on a pair. At the end of the full day tour you'll return by coach to Central Amsterdam. Great for visitors who want to see some of the highlights of Holland whilst visiting the city of Amsterdam. This tour should appeal to a variety of travellers because it combines learning about traditional Dutch culture, tasting locally produced foods, and sightseeing by both bus and boat. Your Experience With Zaanse Schans, Volendam, Marken and Windmills with Free 1-Hour Canal Cruise? Combine sightseeing in Amsterdam's city centre and exploring the highlights of the Dutch countryside. 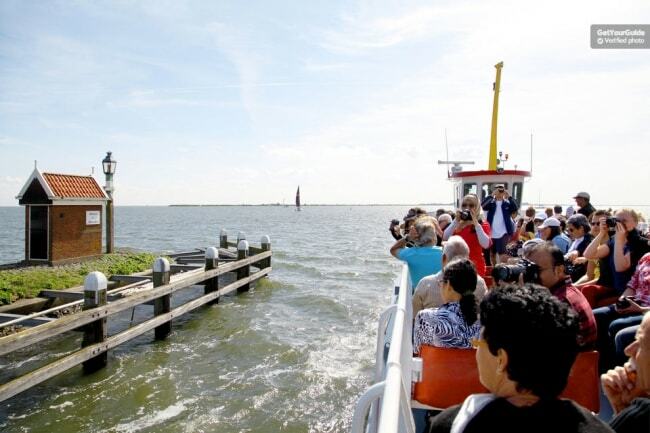 Visit some of Holland's best attractions and immerse yourself in local rural culture. Wonder through classic windmills whilst visiting quaint Dutch villages. Set your taste buds tingling in a typical cheese factory. Take a tour of Marken and learn how the iconic Dutch clogs are made. Take a complimentary cruise on Amsterdam's waterways and discover the city's historic centre. What Zaanse Schans, Volendam, Marken and Windmills with Free 1-Hour Canal Cruise Includes? Boat from Volendam to Marken. An audio guide available in 16 different languages: English, French, Italian, Spanish, Portuguese, German, Greek, Swedish, Polish, Hebrew, Turkish, Arabic, Chinese, Japanese, Catalan and Russian. A complimentary 1 hour cruise through Amsterdam's canals. Depart from Central Amsterdam – visit Zaanse Schans (windmills and cheese factory – ride a riverboat – visit Maken (Clog factory) – return to Central Amsterdam. Arrive early to the departure point in order to get the best seat for sightseeing on your coach. Travelers Reviews about Zaanse Schans, Volendam, Marken and Windmills with Free 1-Hour Canal Cruise? This full-day tour has an impressive 4.5 out of 5-star rating from over 2,000 reviews on the traveller friendly website TripAdvisor. Likewise, there the tour holds a 4.5-star rating on both Get Your Guide and Viator. Travellers say that it is well organised and a good option for seeing a lot of Holland in a short time. Some visitors have said the tour does not feel rushed but a bit more time in each place would be nice. All boats are wheelchair friendly. Tickets for this excursion are accepted in paper or electronic form. Part or full refunds are offered if is cancellation is made 3-7 days in advance. Children aged 3 and under are free but must share coach seats with parents. Lunch and Tips are not included in the ticket price. Meeting Point: Check-in is at Damrak No. 26, 300 metres from Amsterdam Central Station.